Home Food Can I Eat Fruit On a Keto Diet? I’m kidding, of course. I know why people ask this question. It’s because in the keto world fruit is a confusing, often contentious topic. You’ll sometimes see keto folks draw a hard line in the sand, saying that all fruits, or sometimes specific fruits, are “not allowed” on a ketogenic diet. I’ve written before about why I feel it’s inappropriate to label foods as “keto” or “not keto.” People need to consider their own goals, health, activity level, and food preferences when formulating their eating strategies. Nevertheless, it’s true that it can be hard to figure out how to incorporate fruit into your keto diet. On the one hand, it’s “real” food: unprocessed, “whole,” and full of vitamins, minerals, fiber, and phytonutrients. It’s also Primal/paleo approved in moderation. On the other hand, the carbs in a typical serving of fruit can amount to a considerable chunk out of one’s daily carb allotment, especially for people who adhere to a very strict version of keto that only allows 20 to 30 grams of carbohydrate per day (as opposed to the Keto Reset Diet’s 50 gram per day suggestion). So where does fruit fit for the average person following a Keto Reset Diet? Sometimes you’ll hear someone say that keto-ers can’t eat fruit because they “don’t eat carbs.” They really mean that keto folks don’t eat sugar, which is still a gross oversimplification because keto people absolutely do eat carbs. If you’re eating according to the Keto Reset Diet, you’ll start by aiming for 50 grams of carbohydrates per day—perhaps somewhat less if you are dealing with type 2 diabetes or metabolic syndrome—with some wiggle room if most of your carbs come from above-ground veggies and avocados. 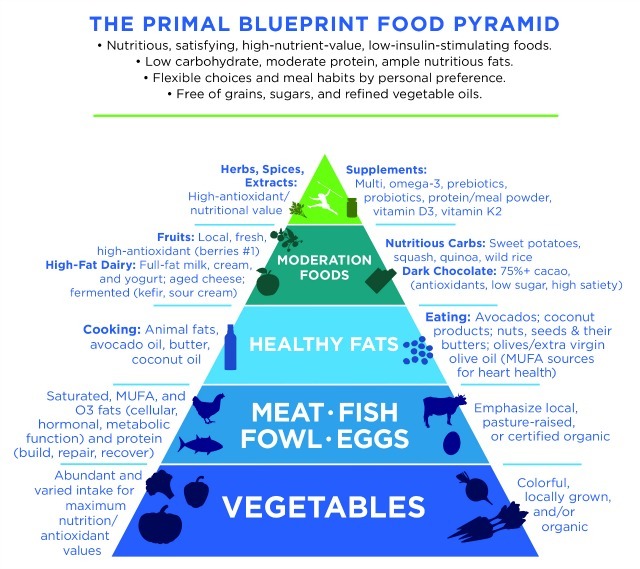 From the point of view of the Keto Reset, we want you to choose your carb sources from among those included on the Primal Blueprint Food Pyramid. That means no grains or added sugars, but eating nutrient-dense vegetables and, yes, even some fruit if you wish. What Fruits Are Best For Keto? When picking the “best” fruits for keto, it comes down to how many carbs are in a serving. Higher carb fruits are going to be harder to incorporate into a keto diet while still allowing room for the liberal intake of vegetables and avocados encouraged in the Keto Reset. The information below is taken from the Cronometer database. Make sure you pay attention to the serving size. I selected what seemed like reasonable servings of each by volume instead of weight (who knows what 100g of grapes looks like compared to 100g of watermelon?). I also provided the weight for reference, as well as the fiber content. The Keto Reset Diet does not recommend counting net carbs for fruit though. Before getting to the data, note that this list omits foods like tomatoes and olives because that’s not what people mean when they ask about fruit. Avocados: Is there any question about them being keto-friendly? So you know, one whole avocado (136 grams) has 12 grams of carbs (9 grams fiber), as well as 21 grams of fat. Lemons: Most people aren’t eating lemons but juicing them, right? The juice from one whole lemon has 3 to 4 grams of carb (about 1 gram per tablespoon). You can see why it is difficult to work fruit into a ketogenic diet, and also why blackberries and raspberries are the most often recommended fruit for keto-ers. Nevertheless, it’s possible. Select lower-carb fruits and limit portion sizes. Eat whole fruit, not fruit juices. Whole fruits induce a smaller glycemic and insulin response. Smoothies can quickly become carb bombs, and they are generally less satiating than their ingredients eaten separately because you don’t have to chew them. Include smoothies mindfully. Consider timing them strategically around the times when you are most insulin sensitive: in the morning and especially after exercise. (This is solid advice for any higher carb food or meal.) Likewise, you might save fruit intake for designated higher carb meals (“carb ups”) if this is part of your routine. However, if you struggle with insulin resistance, any kind of carb ups might not be appropriate for you at this time. But I Heard I Need to Avoid Fructose For Health? Fructose is often demonized because it’s thought (incorrectly) that fructose uniquely contributes to de novo lipogenesis. As Mark has written previously, although fructose and glucose are metabolized differently in the body, it is probably splitting hairs to argue that one is more or less healthy than the other when they are considered in the context of one’s entire diet. And while reducing sugar intake has been shown to improve various health markers, this usually means cutting back on high fructose corn syrup and other added sugars, not eliminating a green apple and a serving of berries. If you’re eating a Primal-aligned ketogenic diet and are already limiting your total sugar intake, it’s probably not necessary to specifically avoid fructose that comes in the form of whole fruit. That said, some of the GI disorders that are so common nowadays might be attributable at least in part to issues of fructose malabsorption. If you have been diagnosed with IBS or otherwise experience chronic GI symptoms, you might consider asking your doctor for a hydrogen breath test to detect fructose malabsorption. You can also try eliminating and then reintroducing fruit to see if it affects your symptoms. If you’re avoiding fruit because you’re afraid to get knocked out of ketosis, remember that once you’re keto-adapted it’s unnecessary to stay in ketosis 100% of the time unless you’re using a therapeutic keto diet to treat a serious medical condition. Also, if there’s a fruit you especially want to include in your keto diet, you can also test your individual physiological response to it using a blood ketone meter. A final word: When considering whether to add more fruit to your keto diet, ask yourself whether you’re still at a point where you would be better off abstaining in order to avoid triggering cravings for sweet foods. This is an n=1 situation. If you feel like some fruit would add to your general enjoyment of your keto way of eating, or you’re looking for ways to incorporate more Primal-approved carbs, go for it. If you’re still struggling to break the sugar habit, perhaps hold off for now, knowing you can always choose to add fruit later. The post Can I Eat Fruit On a Keto Diet? appeared first on Mark's Daily Apple.